30 August 1999 -- Last Tuesday, Bruce Cockburn appeared on KPIG's "Live in the Sty" programme, chatted with KPIG's Laura Ellen, and played a few tunes to celebrate the upcoming 14 September release of "Breakfast in New Orleans - Dinner in Timbuktu". 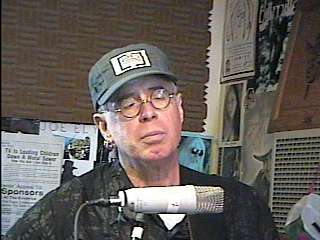 KPIG broadcasts to the Santa Cruz/Monterey/Salinas area at 107.5 FM, from Freedom, California (near Santa Cruz, about 75 miles south of San Francisco). KPIG features a "format-defying blend" of adult rock, acoustic music, blues, progressive country, Hawaiian, cajun, bluegrass, and folk. Tracks played by Cockburn included "Last Night Of The World", "Mango", "Isn't That What Friends Are For", and "Look How Far", all full-length solo acoustic versions of songs from the new album. KPIG also played "Give It Away", a very bouncy and upbeat full band song from the new album, with a Blues Brothersesque funky trumpet section. Cockburn also introduced some "Desert Island Disc"-type personal song requests of "Cathy's Clown" by the Everley Brothers, "Gilded Cage" by The Story, and "'Tis Of Thee" by Ani DiFranco. Cockburn also talked about the Y2K problem, the issue of desertification and the River of Sand documentary, what it was like to meet and play with Malian musicians and how world music has influenced him in general, the reasons behind his mugging in Mozambique, and told a couple of pig stories in deference to KPIG's corporate identity. During the interview, Cockburn mentioned that he would be travelling to Kosovo this week for a couple of benefit concerts along with a line up of other international artists including Philip Glass. The Canadian government, Sting and Bono are amongst the sponsors of the concerts. KPIG kindly archived the hour-long live chat and studio session as a streaming RealAudio file. Access it here and enjoy. KMTT in Seattle, Washington also hosted a five-minute RealAudio interview with Cockburn earlier on the same day.